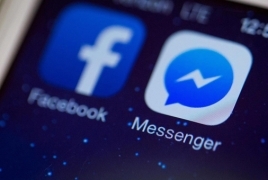 PanARMENIAN.Net - Speculation is increasing that Facebook will open up its Messenger chat service to outside businesses, potentially as early as its F8 conference on April 12-13, VentureBeat reports. Chat messaging so far has been mainly between two individuals, devoid of a way to interact with companies, whether for retail or other kinds of services. “April’s going to be a hot month,” said Mike Roberts, head of Messenger at Kik, the popular messaging app used by more than 8 million people in the U.S., referring to Facebook’s anticipated move to open up its 800 million users to businesses. “It’s huge,” agreed Beerud Sheth, chief executive of Gupshup, a messaging tech company. He called chat “a once in a decade paradigm shift,” where only now is the infrastructure really ready for commerce-related transactions to happen within the chat format. There are more than a few hints that Facebook is about to go big. A way to play chess with a friend within the chap app quietly appeared within Messenger three weeks ago. You simply choose a friend, type “@fbchess play” into the chat box, and a chessboard appears in the window. Then another Messenger bot, @dailycute, surfaced. You select your friend, and the bot delivers up photos of cute animals. These all come after reports of a secret chatbot SDK Facebook released to help developers, an Uber experiment to offer rides through a chatbot, and the appearance of independent bots such as Assist, VentureBeat said.